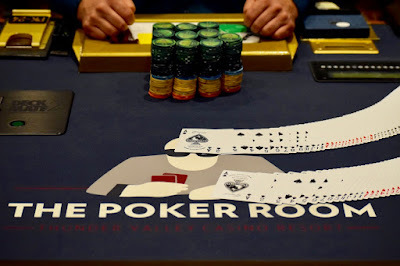 Cards are in the air for the first 6-figure-guarantee in the All-New @TVPokerRoom. Today is the OneDay$100k - a $460 buy-in with a $100,000 Guarantee. Begin with 20,000 stacks and play 30-minute levels. We'll be bringing you photos and videos of the all-new, smoke-free poker room throughout the day and the entire WPT Rolling Thunder series.